AMAZING AMINOS are an essential part of any supplement protocol offering perfectly balanced amounts of pre-digested Amino Acids. 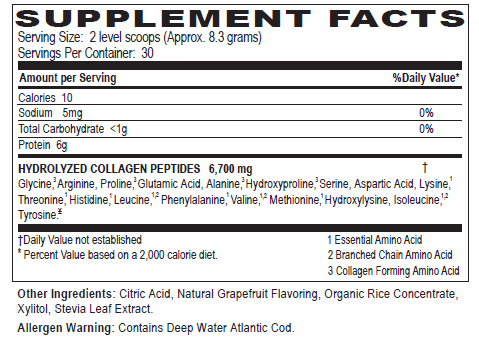 AMAZING AMINOS AC is a New and Improved formula that consists of amino acids, short peptides and minerals that are derived from the finest Atlantic Cod. Most amino acid supplements are produced by industrial processes using bacteria or other synthetic processes while ours comes from a living organism – Fish. Our amino acids are perfectly balanced in the naturally proportioned amounts needed to build new proteins and support physiological processes. AMAZING AMINOS AC contains non-essential amino acids (which can normally be synthesized by the body), as well as essential amino acids (those which must be obtained from the diet). AMAZING AMINOS AC are now provided in a smooth natural citrus flavored powder that you mix with water. AMAZING AMINOS AC will continue to provide you with sizable amounts of Protein Hydrolysate, the most natural extraction of Amino Acids available. Consumption Options: You can either use one scoop in 8 ounces of water, twice a day or 2 scoops in 12 ounces of water, once a day. A Very Important Point… AMAZING AMINOS AC incorporates amino acids in balanced proportions that actually match those found in human body protein. This ensures easy, complete absorption by the body. The natural balance also helps to fill in nutritional gaps in the diet or particular needs due to digestive malfunction. Utilizing enzymes from natural sources, the amino acids and peptides are extracted in a way very similar to human digestion. Following separation of fish oil, calcium from bones and other residual material, the final product is refined and dried to a powder. The raw material used and the proprietary, natural process employed moves AMAZING AMINOS AC far beyond traditional dietary supplement amino acid products. The result is a wholesome and balanced source of nutrition that is compact, safe and conducive to rapid and complete assimilation (high bioavailability), and providing support to all vital functions in the body. When ingested, the amino acids and other ingredients of AMAZING AMINOS AC are absorbed directly through the epithelial cells of the duodenum and through the intestinal walls into the bloodstream. From there they are transported to form new proteins in cells and tissues, as hormones (chemical messengers), as enzymes (biological catalysts), as precursors to neurotransmitters which carry messages from one nerve to another, to a target tissue as antibodies or as carriers for the transport of lipids in the blood, or for countless other tasks. This is what leads to high expectations among medical professionals for AMAZING AMINOS AC efficacy in diverse areas of treatments. Many of these applications would normally be considered the province of the pharmaceutical companies but they are now in the purview of AMAZING AMINOS AC. We call it nutritional therapy.